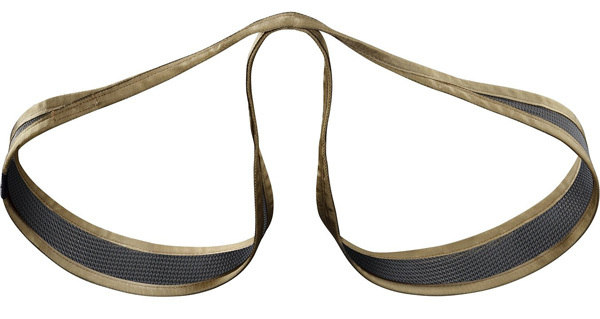 Designed for use in conjunction with the Arc'Teryx H-150 Rigger's Belt, sold separately. Intended as an emergency set-up, the Rigger's Loop is a single mesh sling that folds into two leg loops and attaches to the Rigger's Belt to form an emergency harness. Wider panels on the mesh sling provide comfortable position. Meets EN 12277 harness certification safety rating when worn in conjunction with H150 Rigger's Belt. Sizing: measure around your thigh at the fullest point. • Keep harness away from sharp objects, ice screws, crampons, etc. • Keep away from corrosive substances (battery acids, gasoline, automobile motor fluids, solvents, bleach, etc.). • Store the harness in a dry, dark place. • If the harness becomes wet, air dry it before storing. • Hand wash in warm water with a mild soap (never use bleach), and air dry away from direct sunlight. • Never make any modification to the harness.